A Privately owned Company whose owner and employees enjoys discussing GUNS and weapon accessories, and then selling one or two along the way. Youth Safety is our specialty as our youth is our Future. 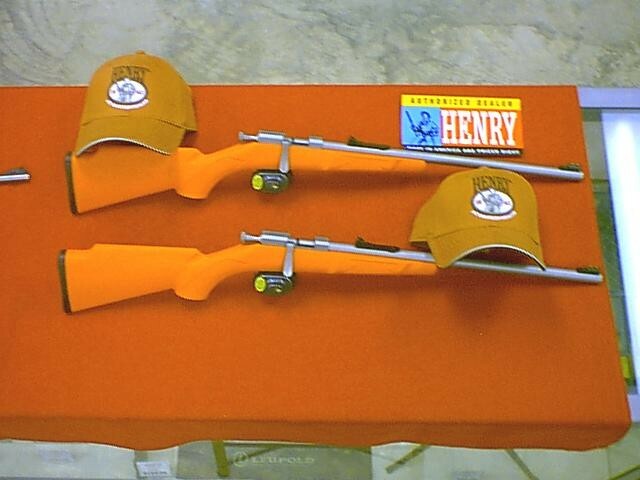 For our range we have Henry Rifles made specially for our youth, recommended for ages 5-6 & up that can be used in our training programs on our controlled range. Shooters the age of 18 and over (long guns) and 21 and over (handguns) may use the range, anyone under 18 (or under 21 using handguns) must have legal guardian present. All participants are required to sign an informed consent liability waiver. You may bring your own UNLOADED hand gun (centerfire or rimfire) or rimfire rifle or rent one for a nominal fee. Only factory ammo may be used and is available onsite. No centerfire rifle cartridges are permitted on the range. We have a layaway program that requires a 25% down payment with 60 days to pay off your item. We charge $25.00 per ATF Form 4473 transfer.